Recently, I was meditating on the word “guidance,” I kept seeing “dance” at the end of the word. I remember reading that doing God’s will is a lot like dancing. When two people try to lead, nothing feels right. The movement doesn’t flow with the music, and everything is quite uncomfortable and jerky. When one person realizes that, and lets the other lead, both bodies begin to flow with the music. One gives gentle cues, perhaps with a nudge to the back or by pressing Lightly in one direction or another. It’s as if two become one body, moving beautifully. The dance takes surrender, willingness, and attentiveness from one person and gentle guidance and skill from the other. My eyes drew back to the word “Guidance.” When I saw “G”: I thought of God, followed by “u” and “i”. ”God, “u” and “i” dance.” God, you, and I dance. As I lowered my head, I became willing to trust that I would get guidance about my life. Once again, I became willing to let God lead. My prayer for you today is that God’s blessings and mercies are upon you on this day and everyday. May you abide in God, as God abides in you. I encourage you to dance with God, trusting God to lead and to guide you through each season of your life. I think it was Christian poet, Ted Loder (Guerillas of Grace) who wrote that the truly Christ-led life was a “dance to the music of heaven” or something like that. Life in the Kingdom is less about following rules/principles or theological correctness, as it is a dance of trust with our Creator/Redeemer. He leads, we follow, and life becomes something different and more wondrous than we ever thought it to be. 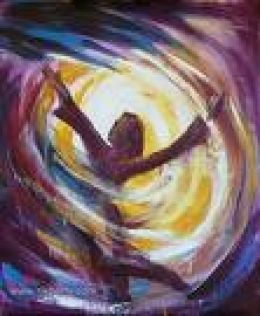 Have you experienced a “dance with Your Creator/Redeemer”? How would you describe your “dance” with God today? A joyful polka? An intimate slow dance? A wrestling tango? A mournful dirge? Now that I have polyneuropathy, I can’t use my arms or legs very well. God has graced me with a long slow dance, with Him holding me up!